Achieving a perfect balance of form and color, Carmen Anocibar designs modern earrings. 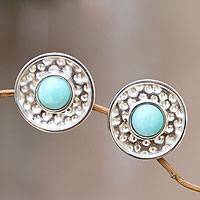 She sets hemispheres of amazonite in disks of hammered silver. 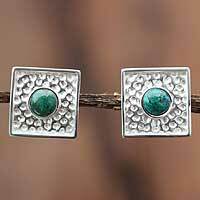 Blue green chrysocolla centers rectangles of hammered silver. By Carmen Anocibar, the clip-on design represents the center of the forest. Fashioning rose petals in shining Andean silver, Carmen Anocibar centers the blossoms with obsidian. It is her stone of choice for these lovely earrings. For Balinese designer Priyo Salim, the rose is a symbol of love. 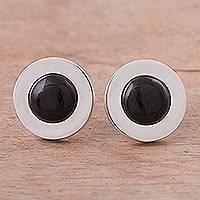 He crafts two lovely blossoms of sterling silver filigree to wear as earrings. Rita Addo Zakour strings polished chips of bright red agate with frosty white accents. Dancing on golden brass hooks, these handcrafted earrings are dazzling.